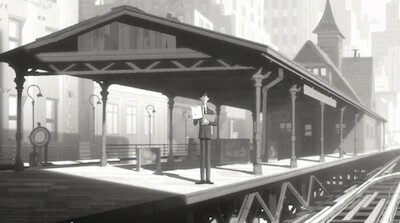 A vintage train platform, tastefully given the Disney treatment. The title character is a young man who works at an anonymous clerical job in Midtown. We can tell he's a secret romantic by his shaggy haircut, large Disneyfied eyes, and a skinny black tie that anticipates early-60s mod culture. (By contrast all the other clerks in his office are bald and wear suspenders.) On his way to work, he has a cute encounter with a pretty young woman who also has Disney eyes, which in the film's fairy-tale symbology is enough to let us know that they're soul mates. He forgets to ask for her number, but as luck should have it their upper-story offices are directly across the street from each other. 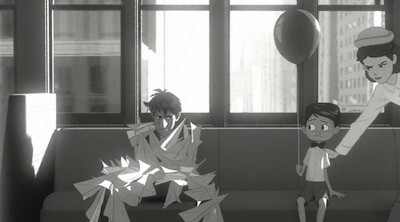 For the rest of the day, he tries to get her attention by making paper planes from the forms he's supposed to review and projecting them at her window. The production design, which presents the downtown work environment as a giant obstacle to romance, inevitably recalls King Vidor's silent classic The Crowd, while the central sight gag brings to mind Johnnie To's recent Don't Go Breaking My Heart. The sentimental tone, of course, is pure Disney. When the paper planes start flying of their own accord to direct the hero to his lady love, they recall the friendly woodland creatures from Cinderella; also the hero's boss is mean-looking enough to suggest a cartoon ogre. That this manages to hit all the familiar emotional cues of a Disney feature in just six minutes shows that Kahrs has a strong grasp of the company formula. I'd be excited if he directed a full-length movie in this style, as there hasn't been a 2-D Disney feature of note in far too long.